Tsunami advisory cancelled for B.C. The tsunami advisory for B.C. 's coast has been officially cancelled after harbours in California and Hawaii felt the impact from waves spawned by a devastating earthquake off Japan Friday, with damage reported and one person missing. The Pacific Tsunami Warning Center issued the advisory after the devastating magnitude-8.9 earthquake that struck Japan. The waves that reached Canada's West Coast barely made a ripple, but officials kept the advisory in place throughout the day as a precaution. Now, B.C. 's provincial emergency program says B.C. is no longer at risk and it will stand down its operation centres. The Pacific Tsunami Warning Center has also cancelled advisories for Washington state and northern Oregon. Advisories remain in place for California, the southern coast of Oregon and Alaska. Record-high waves of up to 2.5 metres were seen in Crescent City, California and one man is missing after being swept out to sea while taking photos of the tsunami there. The coast guard is searching for the man. Four men were also swept off a beach in Oregon by the surge. Two managed to get back to safety on their own, and emergency crews saved the other two men. There was severe damage to the docks and local residents said dozens of boats were "crushed." The surge hit Port Orford, Oregon at about 11:30 a.m. ET on Friday, said geophysicist Gerard Fryer, but there were no immediate reports of damage. Residents of low-lying areas of Oregon, California and Washington had been told hours earlier to evacuate. California, Oregon, Washington, B.C. and Alaska were all subject to various warnings and advisories Friday morning. B.C. 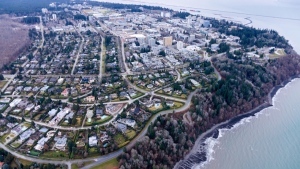 's north coast and the Haida Gwaii Islands were subject to a tsunami advisory, along with the Bella Bella and Shearwater areas and the coast of Vancouver Island from Cape Scott to Port Renfrew. Residents were warned by B.C. 's Provincial Emergency Program that marinas and low-lying areas could be in danger from strong currents and waves of up to 60 centimetres. CTV's Jim Beatty, reporting from the beach in Tofino, B.C., said if tsunami waves arrived there on Friday morning, no one noticed. "This is a rugged coast, there's all kinds of pounding waves and surf that comes in here so we were watching it, locals had a close eye on it, and really if the waves did come in they weren't noticeable because there's a big heavy surf coming in," he told CTV's Canada AM. Many residents in the area had prepared for possible destruction, some staying up all night on the lookout, others moving their belongings. CTV's Sarah Galashan, reporting from Richmond, B.C., said there were no reports of destruction from other at-risk areas of B.C. either. Latin American governments warned islander and coastal residents to head for higher ground because of the tsunami threat. Officials from Mexico to Chile were hauling in boats, closing ports and preparing to evacuate areas along the coast. On Chile's Easter Island, many took shelter at the island's aiport, which is 45 metres above sea level. However, no significant wave activity was noted there. Speaking in Guelph, Ont. on Friday morning, Prime Minister Stephen Harper said the government was closely monitoring the situation in Canada. Though municipal and provincial officials are responsible for addressing any immediate needs in affected areas, Harper said federal officials would work with B.C. to help where they could. "We are closely monitoring the potential consequences on the western coast of Canada and encourage people there to follow the instructions of local authorities," Harper said. Earlier Friday morning in Hawaii, Kauai was the first island to be struck, with tsunami waves making landfall around 8:30 ET, according to the Pacific Tsunami Warning Center. The highest waves were about three metres, and came ashore on the west side of the island, reaching a hotel lobby. One-metre high waves also hit parts of the island of Oahu. The waves swept ashore in Honolulu, swamping the empty beach in Waikiki and overwhelming the breakwall in the world-famous resort. However, the waves didn't reach the nearby high-rise hotels. However, a scientist at the tsunami warning centre said it didn't appear the surge would cause major damage in Hawaii. "But there is going to be some damage, I'm sure," said geophysicist Gerard Fryer in Hawaii. Warning sirens first began sounding overnight in Hawaii, and residents of at-risk coastal areas moved to evacuation centres and tourists were moved to the higher floors of their hotels.